To work properly, your body needs regular exercise – and most of us feel good when we are active. Until the last 100 years or so, you had to be quite active to just live your everyday life. Now, in modern Western societies, so much of what we used to do is done by machines. We drive cars, so we walk less, vacuum cleaners make cleaning easy, and washing is done by a machine. At work we may not even have to move around in the office – it’s enough to sit at the computer. It doesn’t help that modern high-energy foods make us put on too much weight – or that, (in the West at least) food has never been cheaper or easier to buy. I don’t know where, when or how to start. But – it doesn’t have to be about running around a track or working out in a gym. It can just be about being more active each day – perhaps just walking more, or taking the stairs rather than the lift. If medical problems stop you from doing one thing, there may be others that you can do. So – don’t worry about not doing enough – get started by building a bit more physical activity into your daily life now. Even a small change can boost your morale, give you a sense of achievement and help you to feel better in yourself. Help you to feel more competent, or capable. Gardening or DIY projects can do this, as well getting you more active. Give you a sense of control over your life – that you have choices you can make (so it isn’t helpful if you start to feel that you have to exercise). The sense that you are looking after yourself can also feel good. Help you to escape for a while from the pressures of life. Be shared. The companionship involved can be just as important as the physical activity. Most people in the world have always had to keep active to get food, water and shelter. This involves a moderate level of activity and seems to make us feel good. We may be built – or “hard wired” – to enjoy a certain amount of exercise. Harder exercise (perhaps needed to fight or flight from danger) seems to be linked to feelings of stress, perhaps because it is needed for escaping from danger. Exercise can stimulate other chemicals in the brain called “brain derived neurotrophic factors”. These help new brain cells to grow and develop. Moderate exercise seems to work better than vigorous exercise. Exercise seems to reduce harmful changes in the brain caused by stress. As regularly as you can. There will be days when you just don’t feel like exercise – you may feel tired or be too busy or anxious about something. If you keep to your routine and exercise at times like this, you will almost certainly feel better. Why? If you are tired, exercise tends to give you energy. If you are worried, it can take your mind off your concerns for a while. Even if you can’t ‘exercise’, a 15 minute walk can help you to clear your mind and relax. You may find it helpful to listen to music at the same time. If you are active you will probably find it easier to deal with life’s problems and challenges. So – if those problems stop you from regularly exercising, it’s worth remembering that finding time for exercise may well help you to deal with such problems. For mild depression, physical activity can be as good as antidepressants or psychological treatments like cognitive behavioural therapy (CBT). In some areas in the UK, GPs (family doctors) can prescribe exercise. Not much. 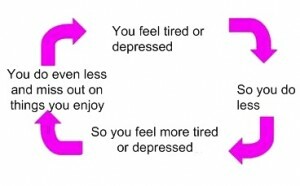 If you are normally very active, you may get depressed if, for any length of time, you can’t exercise because of an injury. If this does happen, you can carry on with exercises using those parts of your body that are not injured. This will help you to keep fit, feel more in control and keep in touch with other people. It can help to set yourself targets – both for the next few days and longer, for the next weeks or months. Some people with eating disorders use exercise to lose too much weight. Some athletes (such as those in weight-related sports like horse racing, boxing and gymnastics) are more likely to develop eating disorders. Physical exercise can cause injuries and some health problems – but you are much more likely to get ill if you don’t keep active. If in doubt, ask your doctor. won’t feel any differenrt for doing it. Exercise can be about playing sport or doing hard-core exercise – if you want that. For other people, it is just about being more physically active and sitting around less. It doesn’t have to be hard – but try to do something every day. Some things aren’t expensive – walking is free and jogging just needs a pair of trainers (cheap ones are fine). If you have a bike already, try cycling to work (or for any regular journey) – you may even save some money. If you haven’t been active for a while, doing too much when you start can make you more tired – particularly if you also have a health problem (including depression) that makes you tired. One day you may have the energy to be really active but feel completely exhausted the next. Whatever you choose to do, start with something easy – like walking round the block. Build your level up gradually, perhaps by just doing a minute or two more – or a few metres more – each day. Try to do something most days, even if you feel tired. They need to be things you can see yourself doing – and take pride in, so you feel good about yourself. You may be able to do it on your own, or with some help from others. Nobody’s perfect. You will have setbacks when you can’t meet a short term goal, or just feel too tired to do anything. Recognise it when it happens, but don’t worry about it. Tomorrow is another day and short term setbacks don’t matter in the bigger picture of your longer-term goals. And, if you need to, do ask someone else to give you a hand.